From time to time people in other countries remark to us, "Oh it must be cold living in Norway". 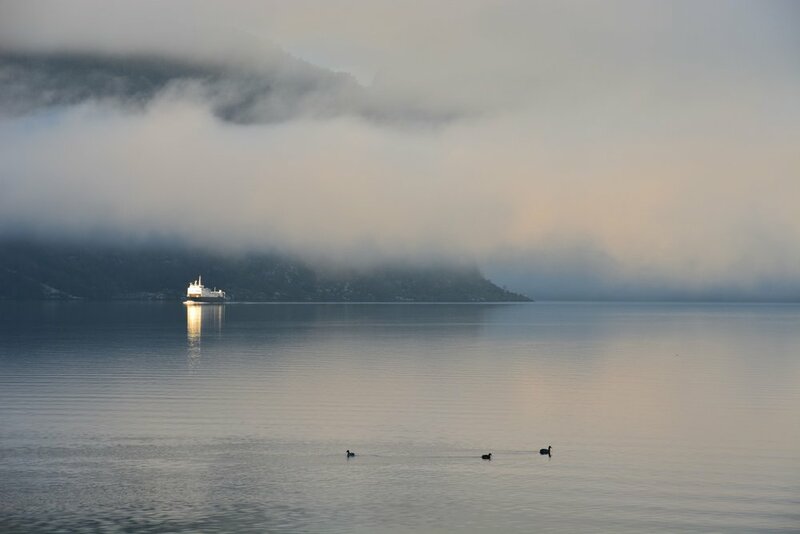 And while Norway is, of course, far from tropics, or even the warmth of the Mediterranean in Europe, you might be surprised at what it is really like here. 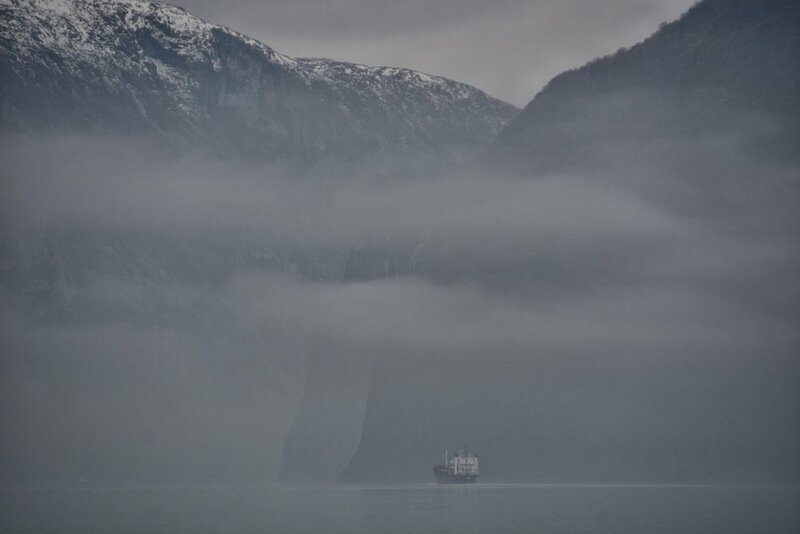 There is a great variation in the weather from the north to the south in Norway. Above the Arctic circle it really is indeed cold. 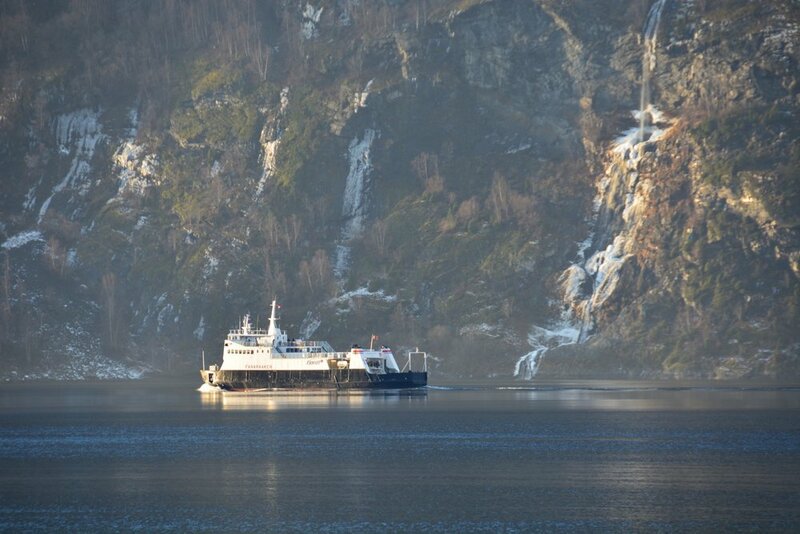 But here in Aurland, in the heart of fjord Norway, the story is quite different. 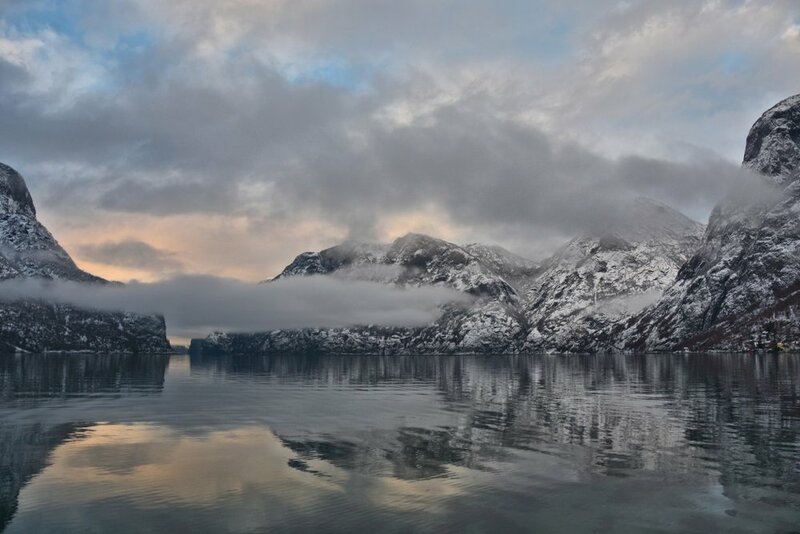 The west coast of Norway is warmed by the gulf stream currents across the Atlantic Ocean which means that the sea is never frozen in winter. And indeed at the coast of west Norway around Bergen, the average temperatures in the winter months can actually remain above freezing. 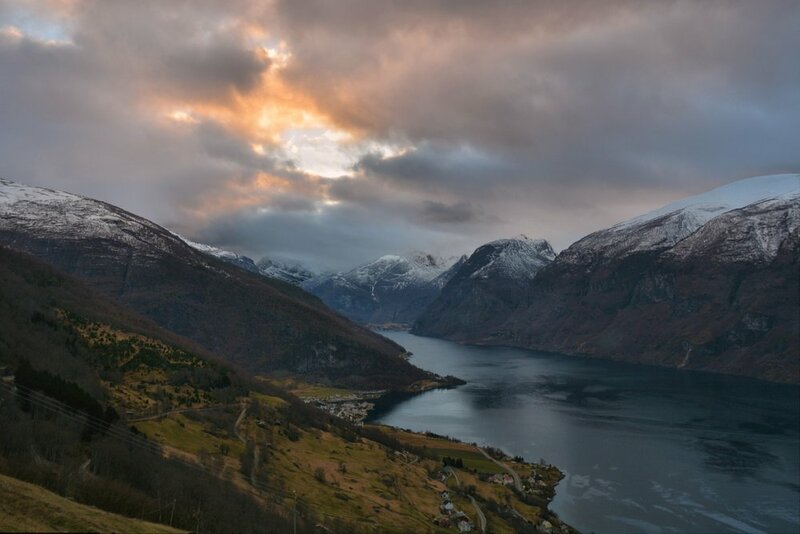 Here in Aurland, the communities in Aurlandsvangen, Flåm and Gudvangen benefit from the fact that the sea, with its warmed gulf stream water, stretches into the heart of west Norway over 100 miles (150 kilometres) from the coast. 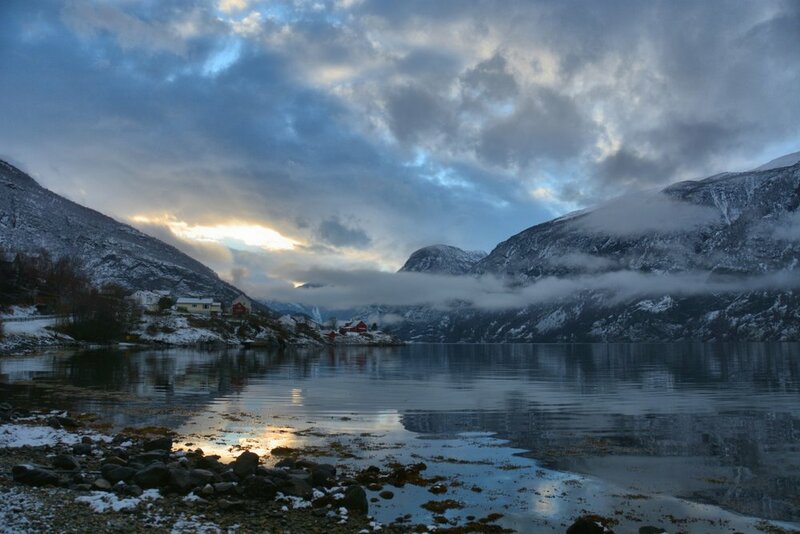 Aurlandsfjord and Nærøyfjord bring the sea to our doorstep as they are inland arms of the huge Sognefjord, Norway's longest and deepest fjord. 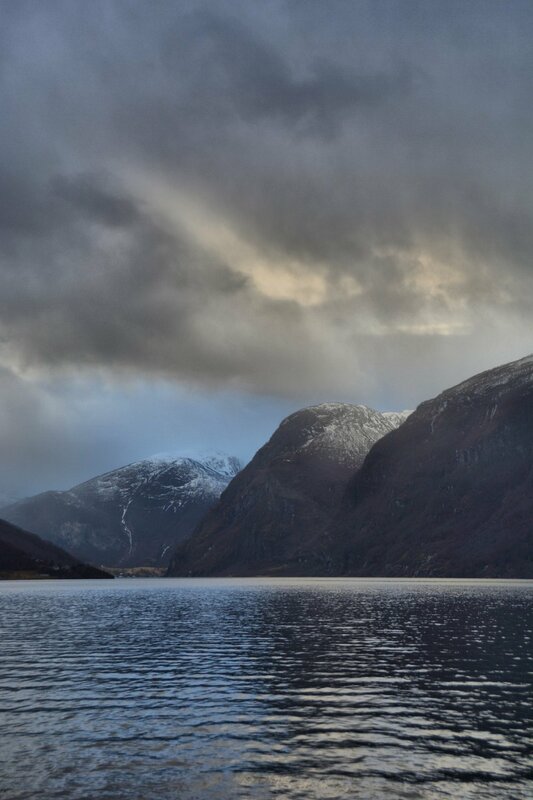 So the mild climate can often mean snow on the mountains, but perhaps much less or even no snow at all at sea level by the fjord. And so it has been this winter. December and January have been exceptionally mild with daytime temperatures almost as high as 10 degrees C on a few days. 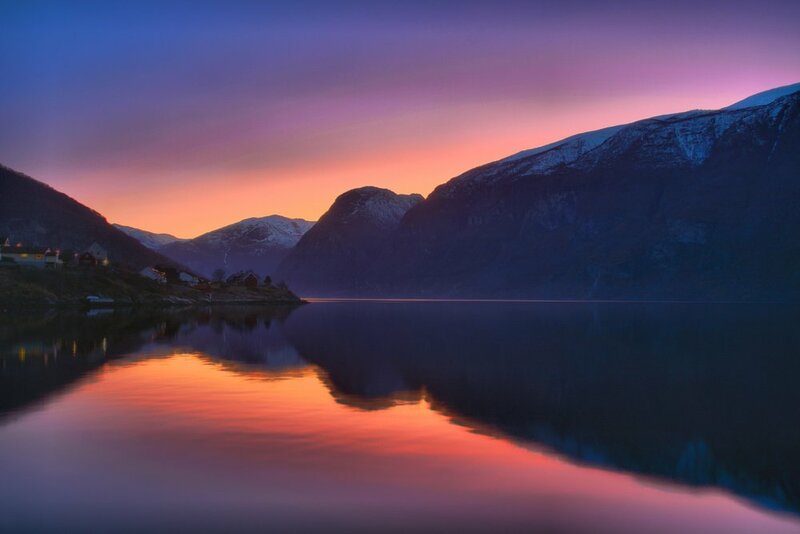 January also saw very little rain or snow and the dry settled conditions have resulted in some of the most spectacular winter sunsets we have seen here in Aurland. Of course, at times, there has been snow too and plummeting temperatures to around -10 degrees C. It's difficult for the visitor to plan for! 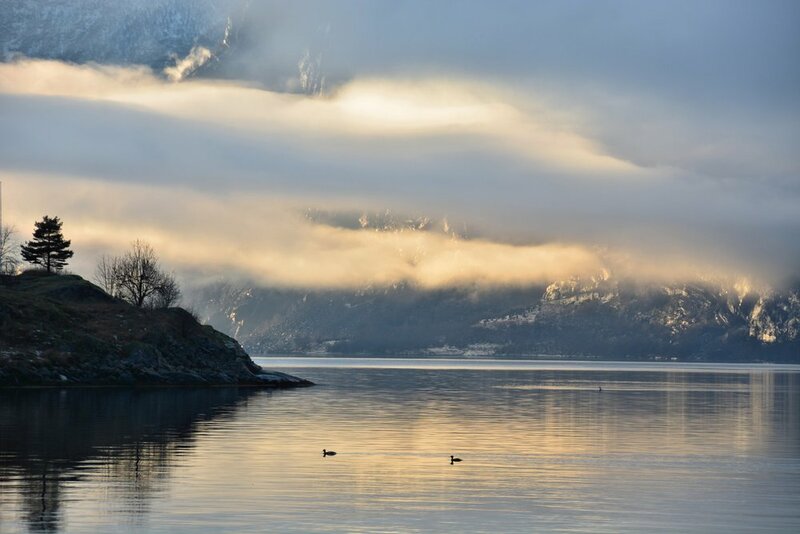 For those of you who have visited Aurland, Flåm and Aurlandsfjord we guess that most of you have visited in the summer months, so we thought it would be good to share with you some of the atmosphere of the fjord in winter. 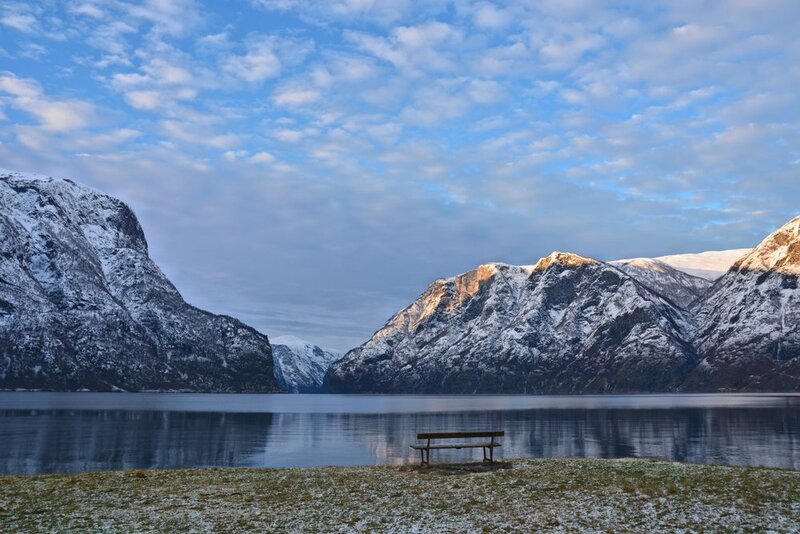 Maybe you could be tempted into a winter visit to Aurland? November actually saw the largest accumulations of snow of the winter. 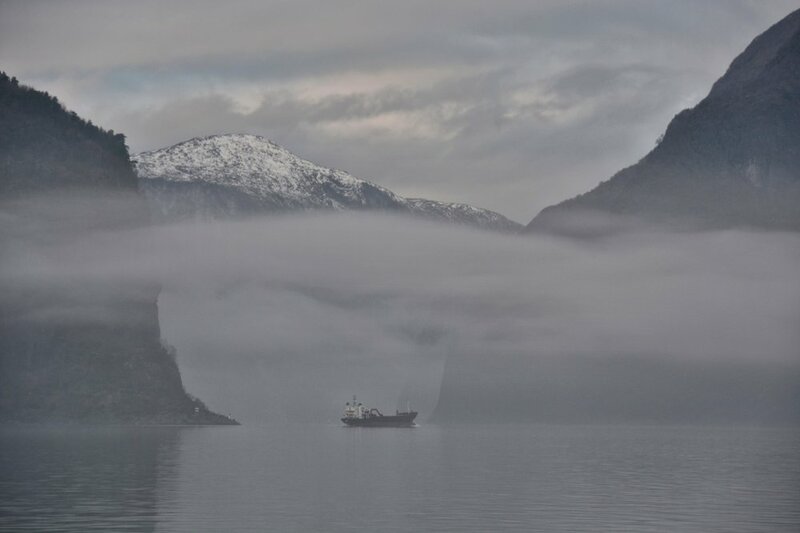 Indeed the snow reached down to the fjord level on quite a number of days this month. 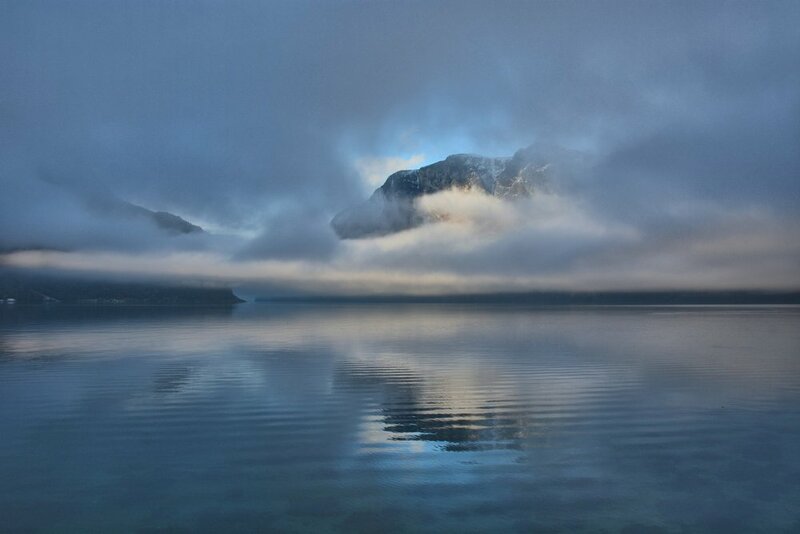 The weather was also slow moving and resulted in spectacular breaks in the cloud, mist and sunlight. The mild weather in December was quite something. Not only did it make short work of the snow at the level of the fjord, but it also melted a lot of the snow at much higher parts of the mountains. In fact, the snow all but disappeared as high up as 700m (2300 feet). 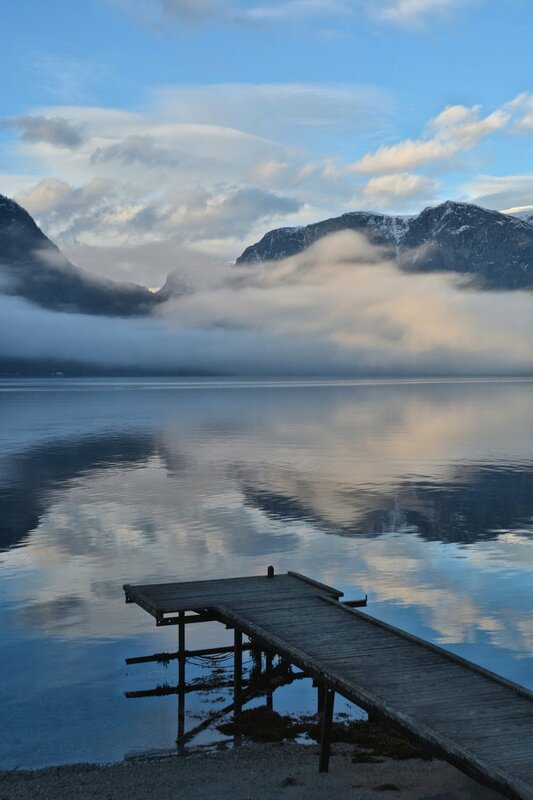 In early December, the sun disappears for 6 weeks, never rising above the height of the mountains. In the pictures below you will see just how little snow there was. 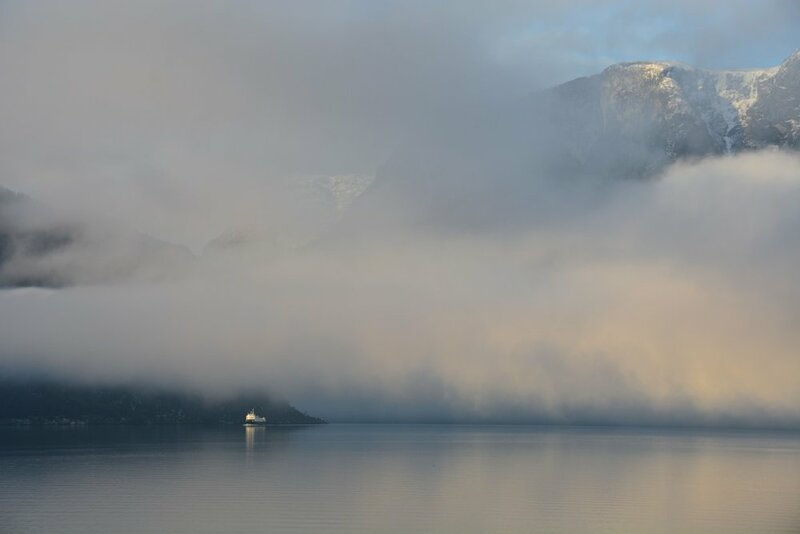 The beginning of the year was cold and snow returned to the fjord. But temperatures didn't drop much below -5 degrees centigrade, much less than the -20 that could be experienced up in the mountains, or indeed in the east of Norway. It didn't last, and the rest of January was mild, settled and incredibly dry. It also gave us the first opportunity of the year for a visit to the amazing Stegastein viewpoint, over 600m (2000 feet) above the fjord. We hope you'll agree, by looking at the gallery below, that the settled weather made for some spectacular views and sunsets. February started where January left off, with mild and settled weather and temperatures generally above zero during the daytime. But it's been a bit more unsettled, more windy and also, perhaps, not as nice. But still, our experiences from being out and about so far this month have proved very worthwhile. We'll hope you agree from the pictures below.